“Our goal was to break the scale down so it didn’t seem like a big house,” says architect Craig Dixon. The house is 5,000 square feet but reads as smaller. The separate garage is clad in stone, borrowing from styles of the English countryside, where outbuildings might have preceded the main house and been made from different materials. When Cathy Groome was asked to describe the style of house she wanted, “Southern-European” was the best she could come up with. But architects Craig Dixon and Todd Pritchett got it right away. “We promised her it would be her favorite house yet,” says Pritchett, who had worked with the homeowner and her husband, Chip, on three previous houses. 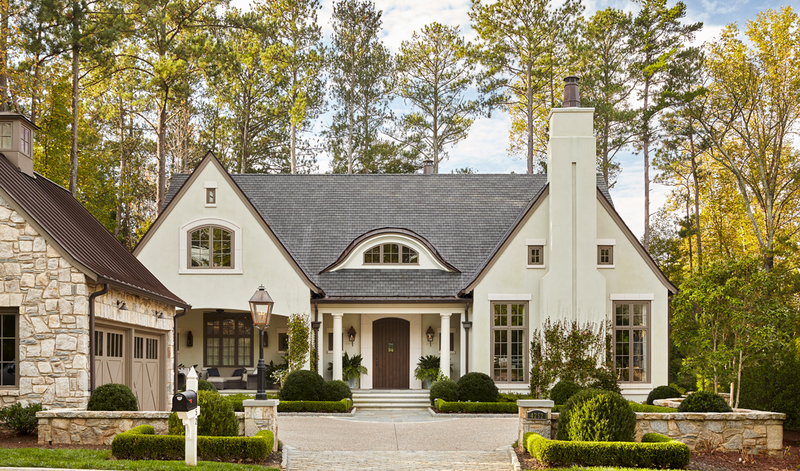 The house is tucked into a wooded enclave of cottage-style homes in Vinings that Chip developed on a 2.5-acre piece of property, all with a European sensibility. “I had a vision of English and French cottages but also borrowed from neighborhoods like Seaside,” he says. His rules for the community: Every house should have a front porch, elevations should be no higher than one-and-a-half stories, no dark red brick, and exteriors should relate to one another, with gas lanterns and front-yard designs by Lands Plus. Sliding iron doors link the breakfast room and screened porch. To keep the view unobstructed, interior designer Susan Negri opted to forgo a light fixture above the table. She selected lively blue-and-white Schumacher fabric for the chairs. 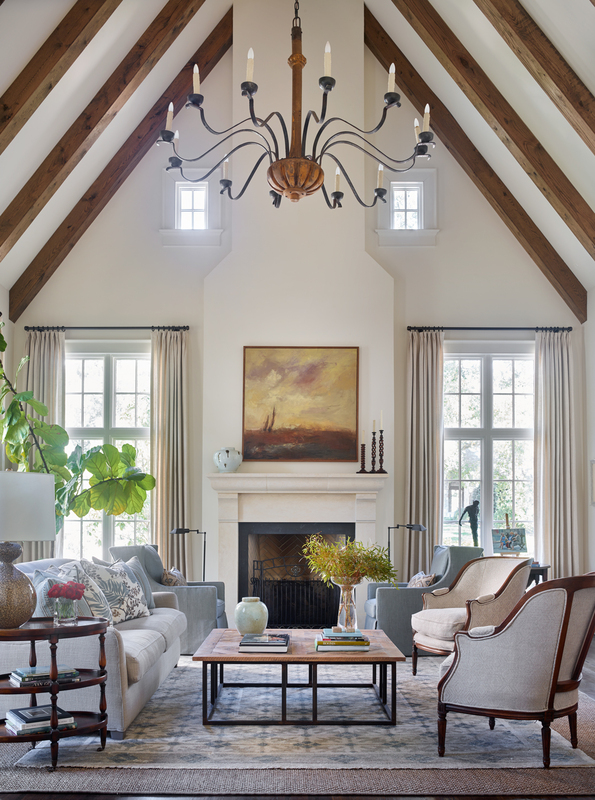 A 25-foot vaulted ceiling fills the great room with light. Negri scored the large chandelier at Foxglove Antiques, attracted to its size but also the materials. “I didn’t want a light fixture that was all wood or all metal, so this one had the right mix,” she says. 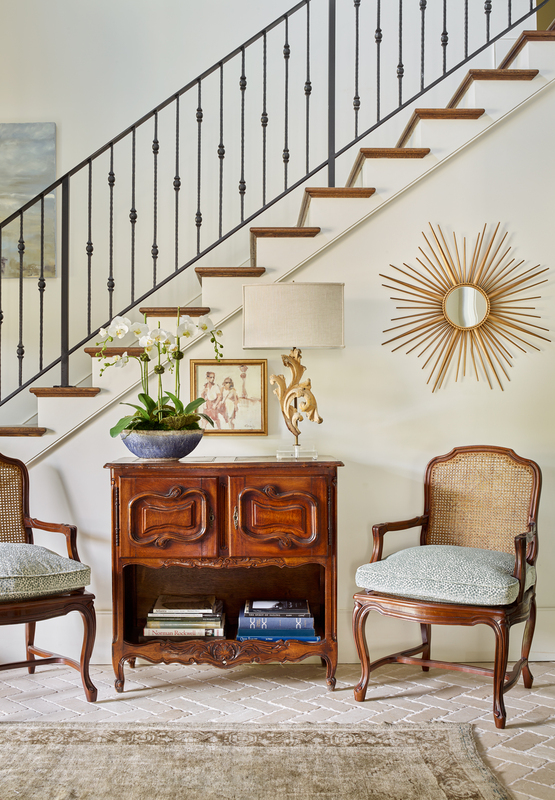 Negri started with the Groomes’ existing pieces—beloved antiques and furniture with a French flair—and freshened them with new fabrics and accessories. A painting by Cathy Groome is seen along the stairs; the homeowner and artist works in a light-filled studio upstairs. 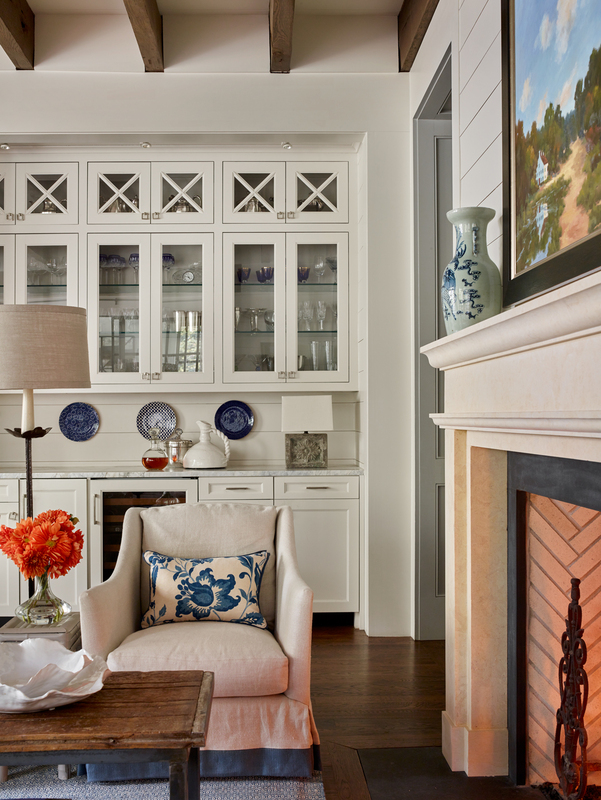 A cozy sitting area in the kitchen includes a fireplace and swivel chairs covered in linen. For the Groomes’ custom house, Pritchett and Dixon’s exterior design relies on symmetry and time-honored materials—hard stucco and stone—with a few clever touches, such as the eyebrow window above the front door and detailing on the chimney. Inside, rooms are arranged on a pleasing axis to create flow, with materials such as limestone floors and white-oak beams providing a rustic warmth. 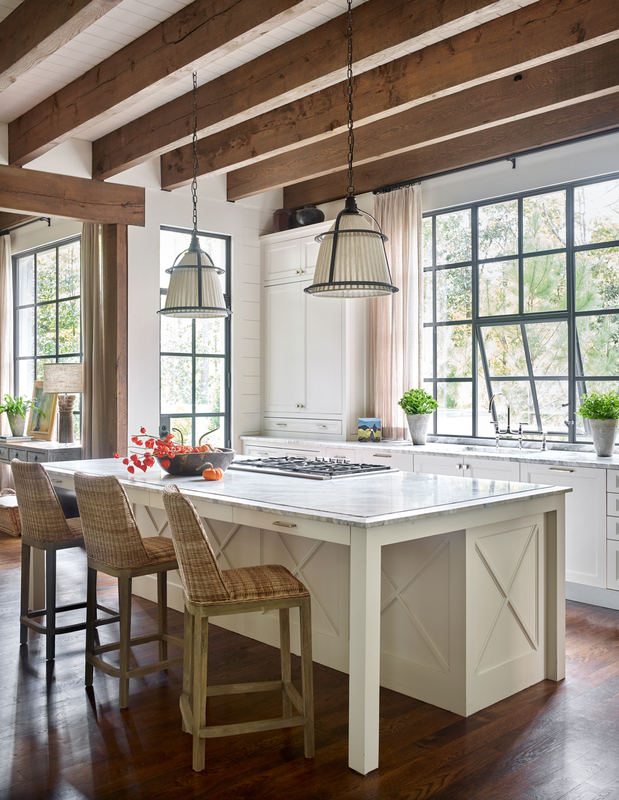 The kitchen is distinguished by iron windows that can open like awnings. antique sideboard Cathy purchased at Scott Antique Markets years ago paired with an abstract painting by Kim Collinson and fluted lamps from Circa Lighting. The custom table is by Bo Childs. classic white marble master bath. The Groomes didn’t want the house to feel too big, but they still tasked the architects with some big-house attributes: high ceilings, wide doorways, plenty of entertaining space, and, most of all—natural light. To accomplish that, the architects added vaulted ceilings in the great room and screened porch, and specified iron windows and doors (which can accommodate larger spans of glass) where it made sense. 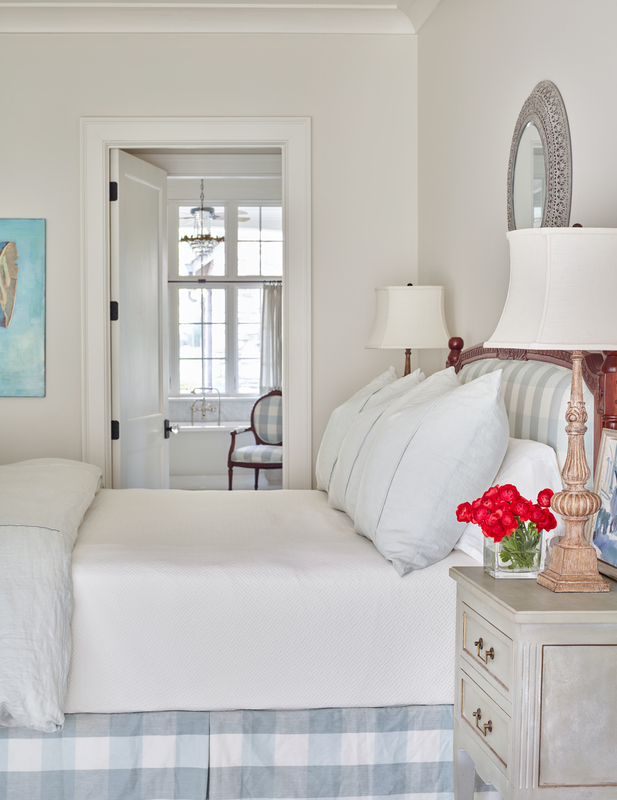 The Groomes’ furniture—a charming mix of French antiques and light blue fabrics curated by interior designer Susan Negri—adds to the feeling that this cottage could be in the south of France. 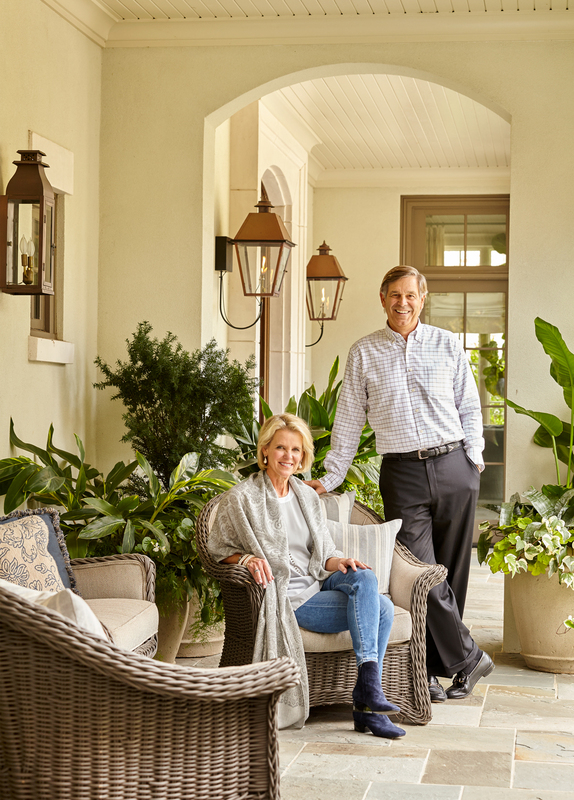 Cathy and Chip Groome have three grown children and several grandchildren who live nearby, so they were able to devote the new house to daily living and focus less on guest bedrooms. The architects enjoyed the collaboration with their longtime clients—even though it could be their last. “I think this might be our forever house,” Cathy says.